Last year Berlin’s Ryan Preece ran full-time with the NASCAR XFINITY Series. When then series makes its return to New England next week at New Hampshire Motor Speedway Preece will make his return to action with the division. 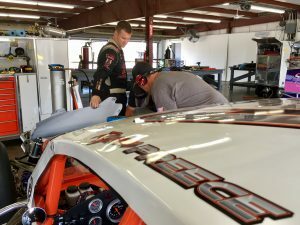 Joe Gibbs Racing announced Wednesday that Preece will drive for them in the July 15 Overton’s 200 XFINITY Series event at New Hampshire Motor Speedway. Preece, a regular and the 2013 champion with the NASCAR Whelen Modified Tour, will also compete in that divisions Nor’easter 100 on July 15. He will also be in the lineup for the Whelen Modified Tour All-Star exhibition event at NHMS on July 14. “At this point I tend to run better when I’m busier, when I’m racing all the time,” Preece said. “Going from XFINITY to the Modified or the Modified to the XFINITY Series, it’s really not a challenge as far as being ready. I’ve always been up to the task. … I’m definitely looking forward to it. Preece will also run the XFINITY Series event on July 29 at Iowa Speedway for Joe Gibbs Racing. Preece has 36 career XFINITY Series starts. This will sell more tickets!!! Yup, great news! Finally a quality ride to show his stuff. A great opportunity for Ryan. Keeps his name out there too. Can’t wait for Loudon. What was it two or three years ago now. Mike Joy visited Stafford and called the SK race with Preece hooked up with an in car mic. Ryan came in second that night to Pennick I believe but in any event it was a special night. Knowledge, hard worker, personality and skill. What more could a big time team want. This guy is the real deal. Great Ride for the kid. That’s a real race team. Great news. The 20 car finished 2nd at NH and 1st at Iowa last year. Pit calls and no errors go his way he could sneak a win. This adds a lot of excitement to Saturdays program.Can’t wait, Ryan is the real deal.Hope this leads to something big.I remember the stupid comments last year when he quit JD.I guess the landscaping equipment can be put away for the time being.Can’t wait for Loudon.Go Ryan! Would also be cool to see him run a road course seeing Ryan did so well last year with a junk car!! Good for him.. Happy to read this..
Time for Ryan to show his stuff in some great equipment! Good luck! Those JD cars ran together like they were HP challenged and driven foot to the floor. I hope Preece gets significant practice time in the Gibbs equipment. Would like to see him do well.